With this iExpression you can literally throw a layer such that it flies through the air and realistically bounces off the ground. Using this iExpression is very easy: Just keyframe the movement of the layer and after the last keyframe the simultation starts automatically. Hence, the throw direction and speed depends on the movement at the last keyframe. To get the desired movement you only need to adjust the height of the ground from which the layer bounces. You can also adjust the elasticity with which the layer bounces of the ground and the gravity with which the layer is attrackted by the ground. This iExpression works with 2D layers. For 3D layers, there is also a Throw 3D iExpression. 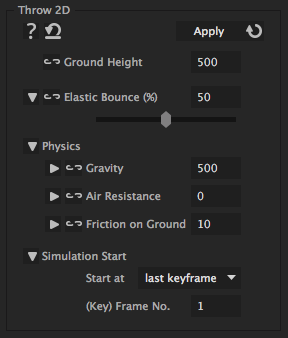 is the frame or the keyframe (depending on the choice of "Start at" option) at which the throw simulation starts. in this tutorial the Throw 2D iExpression is used to make some really cute creatures fall from the sky. The iExpression is used around 11:30.